Pump house, fourth hole. The roof is made of corrugated metal. The main source of irrigation water on my home course is a pond on the fourth hole. The pump is housed in a corrugated-metal building concealed in some bushes near the pond’s far right-hand corner, about 180 yards from the main men’s tees—a location, that, coincidentally, is the universal crummy-tee-shot sweet spot for the average male golfer. (A pro at a golf development in Arizona once told me that you should never buy a house or building lot on the right-hand side of any golf hole 180 yards from the regular men’s tees, unless you wouldn’t mind building a dome over your swimming pool and glazing your windows with Lexan.) Sliced drives that don’t land in the pond often hit the roof of the pump house, making a distinctive clang that you can hear over much of the course. Fourth hole. The men’s tee is in the lower right-hand corner of the photo. 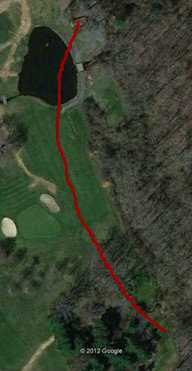 The pump house is at the other end of the banana-shaped red line, 180 yards away. By now, that sound is almost as much a part of our club’s culture as the window conveniently situated above the urinal in the men’s locker room. So here’s the problem: the pump house has been falling down for years—it’s currently being held up by the gray building jack you see in the center of the photo at the top of this post—and we just received approval from the town’s Inland Wetlands Commission to replace it. What I’m wondering is whether there’s a way to “tune” the new pump-house roof so that, when slicers hit it with their drives, it will sound exactly the same as the old pump-house roof. We can’t simply re-use the old roof—an early suggestion—because by this point large parts of it are made mostly of rust. This entry was posted in Golf Courses, Sunday Morning Group by David Owen. Bookmark the permalink. What about using the same building specifications as before and building some give into the new roof to replicate the old, stressed roof? Just a thought. Another option might be a new building with the old roof a few feet over it, though I suspect the new roof below the old roof would moot the reverberation of the sound at least some and change things. Last idea: record the current sound and somehow rig the new roof to emit that sound when struck, but I think tree limbs and such might set it off. Excellent ideas. For a long time, I’ve wondered about doing something similar to modern golf shoes: adding a little electronic gizmo to the sole which would emit the sound of metal spikes on pavement. The technology couldn’t be more complicated than whatever it is that makes little kids’ sneakers flash with every step. But maybe the great old metal-spike sound is too far gone from golf’s collective memory to be recovered, and younger golfers don’t even know it existed, much less miss it. I feel like as long as the new building is built from a wooden frame with the same spacing between wood roof joists and clad in metal sheets with a similar shape and stiffness of the current panels it will vibrate with the same fundamental frequency and produce the same sound. If you really want to tune the sound, you can place threaded rods between the roof joists. Tighten the bolts to put tension into the roof cladding and change the note like a guitar.